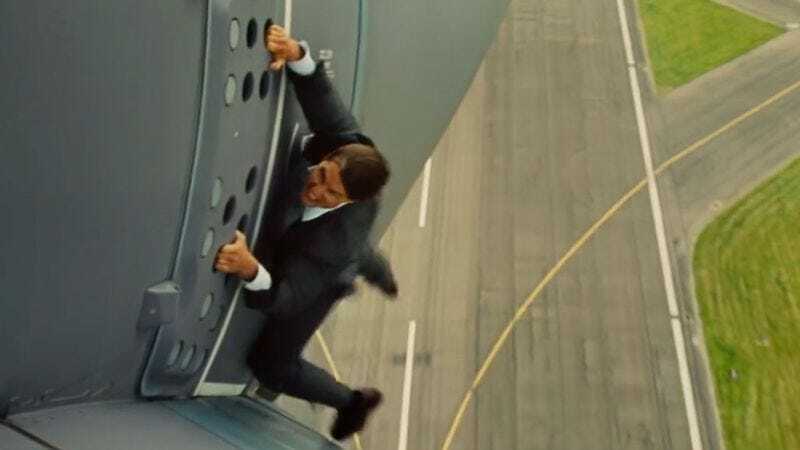 Suggesting that he really wants to be behind the camera when Tom “Sure, I’ll hang onto the side of an airplane” Cruise eventually dies, Christopher McQuarrie has signed on to write, direct, and produce another Mission: Impossible movie. He previously wore those same hats for Mission: Impossible—Rogue Nation, and rumors of him returning for another one of Ethan Hunt’s fairly difficult tasks first started popping up earlier this month. Now, according to The Hollywood Reporter, McQuarrie has just made it official by tweeting “Mission: Accepted #MI6,” which is the sort of thing that happens in 2015. The real question now is what sort of ridiculous stunt Cruise will risk his life with this time around. The last two movies had the aforementioned plane stunt and Cruise climbing Burj Khalifa, which presumably means he has to go into space for Mission: Impossible 6. However, since clinging to the outside of a rocket as it leaves the atmosphere would be a repeat of the last movie, maybe McQuarrie will just strap some huge engines onto Cruise’s back and point him at the sky. If anyone could survive something like that, it’s Tom Cruise (hopefully).